On Wednesday, Airtel Uganda officially launched the 7th edition of the ‘Airtel Raising Stars’ at the StarTimes stadium in Lugogo. The tournament is one that gives boys and girls under the age of 17 an opportunity to show case their abilities in hope of securing a sports career. Managing Director, VG Somasekhar led the delegation, flanked by the marketing director Indrajeet Kumar Singh, Neola Byuma (Brand Strategy Manager) and the Public Relations Officer (PRO) Faith Fiona Bugonzi. The FUFA team had the 2nd Vice President Darius Mugoye, Executive Committee member Rogers Byamukama, FUFA Youth Development officer Bashir Mutyaba and the marketing director Esther Musoke. The global talent search platform aims to develop grassroots football by encouraging and nurturing the youths’ football skills and providing them with the opportunity to evolve and acquire new football techniques that will turn them into distinguished soccer talents. 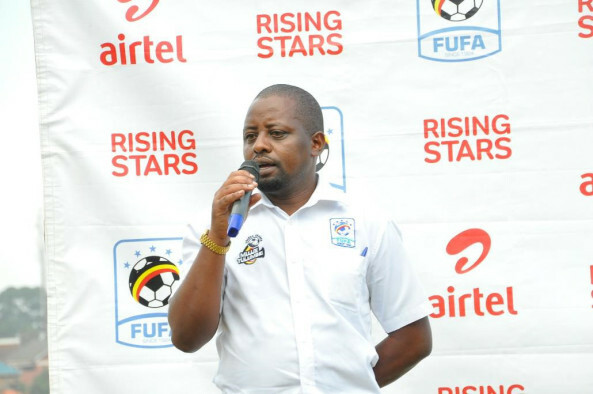 Darius Mugoye who represented FUFA President, Moses Magogo at the event, expressed his excitement and also thanked Airtel Uganda for its continued support to the development of football in the country. FUFA 2nd vice presdident, Darius Mugoya speaking at the event. “We are excited that the 7th edition of the Airtel Rising Stars U-17 programme is here, said Mugoye. “In the previous editions, there has been value added to the game of football with in the country. “Since 2011, a number of stars have graduated to the Uganda Cranes, U-20l, the Crested Cranes and the U-23. “We are excited about the partnership with Airtel Uganda, continued Mugoye. “No wonder, that during this partnership, we managed to have the Uganda Cranes promoted to the African Cup of Nations. “As a federation, we believe in building from the grass roots. The tournament that started in 2011 has identified many celebrated stars such as Farooq Miya, Muhammad Shaban, Martin Kizza, Kezironi Kizito, Fazila Ikwaput, Hassifah Nassuna, Allan Okello, Pius Obuya, Bashir Asiku, Mathias Muwanga and many other talented players who have gone on to play professional football and in the local leagues. 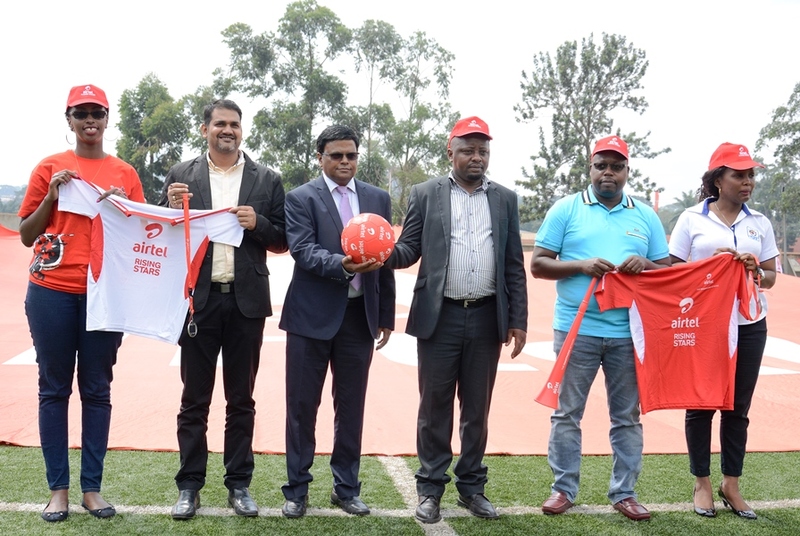 The managing Director of Airtel Uganda, VG Somasekhar gave a detailed account about the activities of the company in line with the Corporate Social Responsibility (CSR) cause where sports are part. “We are transforming the telecom industry in Uganda, said Somasekhar. “It gives me great joy in kicking off this season 7 of the Airtel Rising Stars. “Our Vision is to be the best loved brands in the daily lives of Uganda. With the best communication and we want to bring out the next stars. “There are 56 tribes in Uganda, Football is the 57th that unites all the others, continued Somasekhar. “Like our brand ambassador Eddie Kenzo, football first identified him and it got him to school then music. “We encourage many young kids to take on football. This game is not only limited to Kampala but is to be played across the 8 regions of FUFA. “We support football (through the Uganda Cranes sponsorship, Airtel Rising Stars and Airtel Masaza Cup), Kabaka Birthday run, education and culture. Airtel Uganda’s relationship with sports is well documented. Since 2011, we are growing strong and bigger. This year, the matches will be played in the five (5) regions with Fort Portal hosting the finals on 27th of August, 2018. The football matches will be closely watched and followed by FUFA selected scouts whose role will be to identify Uganda’s next superstars. Meanwhile, the official kits that will be used for the 7th Airtel Rising Stars tournament were also unveiled on the same day. Thereafter, there was an exhibition girls’ football game was played between the Katuuso community girls. The Katuso community teams posing for a photo with officials. The inter-district championships will kick off mid-June with the regional qualifiers continuing throughout the month to July 2018.